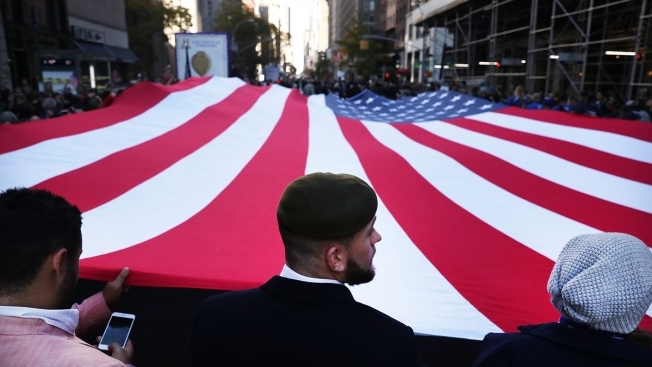 In this Nov. 11, 2016, file photo, veterans and others carry a large American Flag while marching in the nation's largest Veterans Day Parade in New York City. The Department of Veterans Affairs told congressional staffers that it will not reimburse veterans who have been paid less than they were owed after student veterans across the country said they have received delayed or incorrect GI Bill benefit payments, NBC News reported. The news conflicts with a promise VA officials made to a House committee earlier this month that it would reimburse those veterans who received less than the full amount they were due. Two committee aides told NBC the VA said it could not make retroactive payments without auditing its previous education claims, which it said would delay future claims. Some veterans have been forced into desperate financial straits stemming from a change in calculating housing allowances under the Forever GI Bill, which President Donald Trump signed into law in July 2017. When its computers were unable to process that change, the VA quickly faced a backlog of veterans’ claims three times higher than normal. Because of those issues, the VA had announced earlier on Wednesday that it would delay the Forever GI Bill housing allowance changes until Dec. 2019 — and again promised that retroactive payments would be made to those who did not receive a correct amount. But officials told congressional staffers that once the system is made right next year, they would not make retroactive payments to those who were underpaid because of the housing miscalculations. When asked for comment, a VA spokesman reiterated that the agency would delay paying housing allowances in accordance with the new Forever GI Bill until the spring term of 2020 and instead pay housing allowances based on Department of Defense's older Basic Housing Allowance rates.